Today I learned about "tethering," a way of using your cell phone as a wifi hotspot for yourself when internet is not available. You can use your laptop or tablet via your phone's internet. I've always wondered if this was possible but never really looked into it as I never needed it. It seems to be a very convenient way of obtaining internet access when none is available. The only problem is that the cell phone providers have learned about it and have been trying to shut it down for obvious reasons. They don't want people draining their bandwith and taking advantage of their unlimited data plans. At one point they started deleting programs that allowed tethering and charging additional fees if you were tethering via their services. Recently, however, the FCC made Verizon settle and not charge consumers for tethering(all except for the unlimited data plans, go figure). I of course have an unlimited data plan so I would have to pay an additional $20/mo if I want to tether - something I might consider because $20/mo is still cheaper than paying $50/mo for my internet access via Time Warner. Interesting stuff, huh? Ok, maybe not... let's get to the nail polish! I gleefully found the second Twilight collection at Ulta recently and had to pick up all four polishes. These polishes can be found in a special Twilight display that contain a highlighter, blush, lipgloss and glitter. For the polishes, there are three of each color available in the display. The polishes were on my must buy list, not because of the books(although I've read and seen the movies), but because the first collection was amazing! I had high hopes for the 2nd so let's see if they live up to the first collection's reputation. Surprisingly they all had wide OPI/Dior like brushes, which I'm clumsy with using so please pardon if I color outside the lines. I didn't use any topcoat in these photos. The first polish of the collection is Jacob's Protection, a black based polish with blue flecks throughout. Formula was a little bit on the thick side which made handling the wide brush even more difficult. It wasn't quite opaque after two layers so I went with three to get full opacity. The blue flecks are slightly duochromatic so you get flashes of purple here and there. The 2nd polish of this collection is Alice Had A Vision - Again. 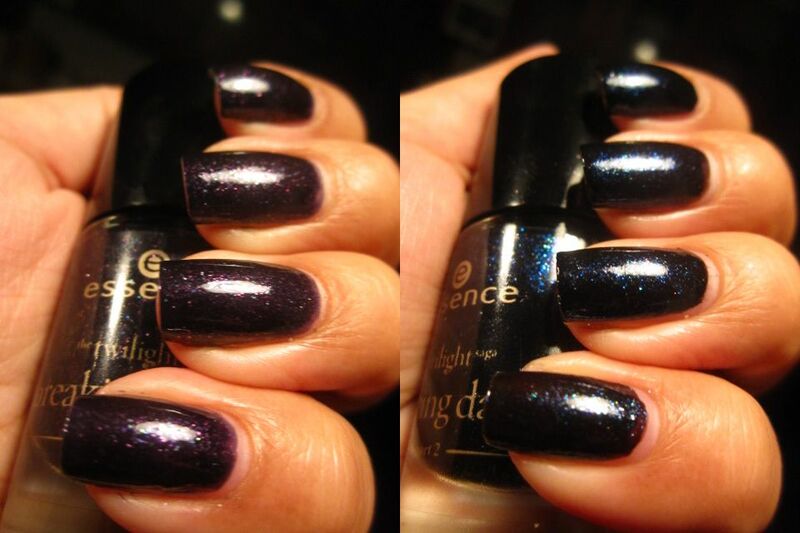 This is another black based polish but with purple flecks. I had the most difficulty amongst all four polishes with this one, as I found the formula to be super thick but not pigmented enough to be opaque until three coats. It was really streaky to use as well. Once on it's really gorgeous but personally the color payoff wasn't really worth the application for me. 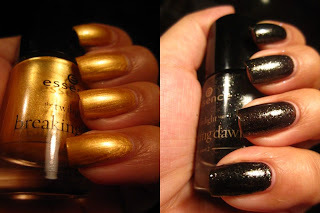 The 3rd polish of this collection is a darkened gold foil called Piece of Forever. I don't usually wear golds like this but with the rising popularity of gold lately I figured I'd give it a try. This took four layers to become fully opaque as the formula was really thin and sheer. Once dried there are plenty of visible brush marks as well. After wearing it, I still don't like gold on me but it doesn't look too bad in these pictures. Finally, Edward's Love is a black base with silver flakes, a polish that's probably got a ton of dupes already out there. This took only 2 layers for opacity and I found the formula the easiest to use out of the entire collection. The silver flakes really come through against the black which might set this apart from other black and silver polishes. Overall, the colors are really nice but I'm not a big fan of blackened or gold polishes. I think the colors really represent the characters and the movie well, so bravo to Essence for putting out this collection. I only wish the colors were a little easier to apply. My favorite is still the first collection as it has more colors that I liked and are more unique colors than these. What do you think? Will you be rushing to your Ulta for these polishes? If so, hurry because they're limited edition and there are only three of each color available in each display. They're $1.99 each so you can't go wrong!